Interested in an adventure for the sci-fi OSR game White Star? Then Darrel Miller from DM Studios might help you out. 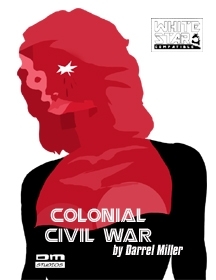 His second adventure, Colonial Civil War (CCW), is available at Drivethrurpg for USD $1.00. I already reviewed Darrel’s first module (Star Temple of Saturgalia) here if you’re interested in a module with a Star Wars feel. CCW is an homage to Battlestar Galactica. This is obvious if you look at the cover. For 1 buck, you get a 9-pages-PDF with 6 pages of content (the rest is the cover, some intro text and the OGL). The module comes with two small no-frills maps and some sparse but good-looking illustrations. The layout is classic with 2 columns. Everything is easy to read. There are some minor issues when stat blocks are spread over two pages, but that’s a small nitpick. There is some confusion with the names of the starships, I think the author renamed them in the process of writing this module but forgot to update the PDF. All in all, it’s not an exciting looking product but solid work for a small niche publisher. This is such a cool “rip-off” of BSG, it’s quite cheeky but also pretty awesome if your players know the series. There is a lot of suspense and action for the players. The story is interesting. You start in space around the Continental One, the flagship of the president. There is an attack by the Cyborgs and you have to protect President Rose Lane (Act I). Afterwards, you return to your WarStar “Unicorn” just to discover that someone has injected a computer virus into the system. Now the players need to defeat the virus and find the Chimera Cyborgs (Act II). I like that you have to fight on two fronts: stop the virus and find the enemy. The rules for battling the virus are pretty neat. There is no act three because Act Three is what your players do. How do they resolve this problem, for good or ill? It all happens when you play the game. Enjoy!!! but the author gives you some pointers on how to uphold the tension. They could be more fleshed-out, but at least there are some ideas. Where do I see room for improvement? It would be helpful to state that this is a low-level adventure in the description of the product. The module feels a bit railroady. There is a clear idea how it plays out. Rescue the president, then get back to your WarStar. Oh, there is a virus. Hm, what caused it? Oh, wait, here is a cluebat which I can drop down on my players so they know that Cyborg Chimeras are on board. This feels kinda lame to me. The rest of the adventure is per default kinda hack-&-slashy. There are six Chimerans on board which the players need to eliminate. The GM doesn’t get a lot of info on how to flesh out the Chimerans. Ultimately, their goal was to assassinate the president to start a civil war or take control of the WarStar to attack the planet. So, when it comes down to hunting the Chimerans are they willing to give up or will they fight till the end? I guess that’s what you’ll need to decide yourself. Furthermore, with the Chimerans able to look like any crew member, I assume that you constantly have the players catch them in the act or play the Chimerans as quite dumb. Wouldn’t it be more logical to pretend to be an innocent crew member? There is no info on how the players can find out if someone is a Chimeran or not if one pretends to be. Wouldn’t that be an interesting role-playing opportunity where the players try to question the crew in order to find out who is an imposter? If you want that, you as the GM need to come up with ideas yourself. The map of the WarStar is serviceable, but I wonder why everything plays out on one level. It’s a big starship, it makes no sense. I would have liked a map with different levels. Again, a really nice idea and a module with some potential. Like the first module by DM Studios, I feel this a bit bare bones and could use some more background material to make it a bit more interesting and offer more options than the default route. Still, I like it better than Star Temple of Saturgalia as fighting the virus and finding the Chimeran Cyborgs is pretty cool. All in all, for $1.00 I like this module and with some adjustments I would also run it. The Solo Sandbox: What Do We Know and How Do We Know?